This year, 17 July 2018 marks the 20th anniversary of the Rome Statute, the founding treaty of the International Criminal Court. On International Justice Day, JRR joins the world to celebrate the many achievements to advance accountability for serious international crimes, and reaffirms its commitment to providing rapidly-available expertise to support justice efforts everywhere. 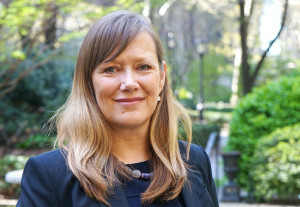 To mark International Justice Day, we take the opportunity to talk with JRR Executive Director Nina Suomalainen, who joined JRR in May 2018. In this Q&A, she reflects on JRR’s current contributions to accountability, how the organization is responding to new challenges in the field, and plans for the future as JRR looks ahead to its 10th anniversary. JRR: What made you interested in the work of Justice Rapid Response? NS: I have a longtime commitment to international affairs and human rights and have worked in international organizations, the civil society sector and also in politics. When I first learned about JRR, I was impressed by JRR’s mission to help bring perpetrators of war crimes and serious human rights violations to justice through international mechanisms or national jurisdictions. The main contribution of JRR is its extensive expertise, which JRR has built over the years to be able to support investigations quickly and efficiently. JRR experts—nearly 700 carefully-vetted individuals—not only work around the world, but they are from around the world: they are forensic experts from Brazil; Arabic-speaking sexual violence investigators; Colombian transitional justice experts; Russian-speaking military analysts; Nigerian gender advisors…and this is just to name a few. I’m also very proud that the JRR roster is 56% women. This diversity means that whatever requests for expertise come our way, we are almost always able to provide it, whether to the United Nations, the International Criminal Court (ICC), governments, or new mechanisms like the International, Impartial and Independent Mechanism for Syria (IIM). In the face of horrific crimes that take place in complex conflicts, JRR has made it easy for the international community to request and receive the best possible professionals to support justice mechanisms, and to access them quickly. Having myself a number of years’ experience in multilateralism I recognized the gap that JRR was filling. So for me, it’s an exciting time to be leading an organization that is playing a vital role in the fight against impunity. And there are still so many other areas in which we know JRR experts could assist. JRR: Much of the work of JRR experts is confidential. But is there a specific case that you can talk about where JRR experts have made a difference for justice? NS: The case that comes to mind is that of the trial of Hisséne Habré, former dictator of Chad. Even though Habré had been ousted from power and had fled to Senegal, the survivors of his regime decided that they would not let Habré’s brutality go unpunished. But as the investigations began, it required experts, such as a military analyst and a forensic hand-writing expert, to demonstrate conclusively that the former dictator bore direct responsibility for the crimes that occurred on his watch. JRR deployed experts from its roster to assist, and in May 2016, Hisséne Habré was convicted of crimes against humanity, war crimes, and torture, including sexual violence. He was sentenced to life in prison. In the end, the case was a huge victory for the victims, and also spoke to the power of collaboration between various justice actors, including JRR experts, to get high-profile cases over the finish line. This is just one of many cases where JRR experts have been the “missing link” in an investigation. Large, public victories like the Habré case take a long time, but are a clear reminder that no architect of atrocity is beyond the reach of the law, and all processes—whether at the beginning such as documentation work, or later in the trials of senior perpetrators—must be supported by professionals at every step of the way. Another way JRR is making strides is by helping to change the overall approach to investigations everywhere by showing what is possible when qualified and experienced personnel are a part of investigations of serious crimes. Here I would mention how JRR has helped raise the standard of the investigations of sexual and gender-based crimes across the board, together with our partner UN Women. JRR: What are the trends you see right now in the field of international justice, and how is JRR responding? NS: One area we have seen developing is the role of non-state and civil society actors in documenting human rights abuses. In the absence of credible accountability mechanisms or functioning rule of law, communities affected by conflict understandably feel the need to gather evidence themselves. There is a real desire on behalf of many actors in the field to understand how to document alleged crimes, or how to interview victims of conflict with hope that it can be used by accountability mechanisms down the road. As JRR has articulated before, this is incredibly challenging, especially as there is no single, commonly accepted set of rules of procedure and evidence for international or domestic criminal investigations. This makes it even more important that the collection of information for accountability purposes be done and supervised by professionals. We are engaged in many other crucial areas as well, for example increasingly deploying experts to work with national courts and transitional justice mechanisms. Through our Complementarity Programme we are supporting these governments as they develop capacities to investigate and prosecute serious human rights violations and war crimes. Recently we have deployed experts to The Gambia, Mali and Guatemala, and are working with other partners in national contexts. Lastly, we are providing support to institutions that may be less familiar on how to conduct internal investigations on allegations relating to Sexual Exploitation and Abuse (SEA). I am pleased that JRR has already been asked to assist various actors and we remain available to provide assistance in this area, for example through child protection expertise or drafting internal procedures for investigations. JRR: Speaking of sexual violence, a large part of JRR’s work has been to advance investigations of sexual and gender-based violence (SGBV). Going forward, can you speak about JRR’s strategy on this issue? NS: JRR has done outstanding work to advance justice for SGBV and ensure it is considered amongst the core international crimes. To date over 100 SGBV experts have been deployed to support investigations and documentation in Burundi, Eritrea, Democratic Republic of the Congo, Democratic People’s Republic of Korea, Libya, and South Sudan. Many readers will have also learned about our experts’ work in Syria and Iraq through a short documentary film we produced last year. In partnership with UN Women, JRR has been able to deliver specialized expertise to backstop national and international accountability mechanisms. And through this support, we’ve also seen norms and attitudes starting to change about how gender is included in all investigations of international crimes. In fact today, any investigation that does not look at issues of SGBV is widely viewed as unsatisfactory. JRR’s contributions have been increasingly recognized: for example, this year JRR will be honored on the Gender Justice Legacy Wall at the premises of the International Criminal Court in The Hague. JRR’s vision of gender justice has been, and will remain, a world in which investigation and prosecution teams are equipped from their onset to address gendered experiences of human rights violations. To achieve this, JRR will expand our engagement on SGBV with transitional justice processes. We are also helping the international community address sometimes overlooked patterns of SGBV against children, men and boys, as well as lesbian, gay, bisexual, transgender or other groups on the basis of their gender or perceived identity. JRR: As the new Executive Director of JRR, looking to the future, what are a few of your goals for the organization? NS: Over the years, JRR and its partners have worked hard to build up an impressive expert roster, composed of some of the top criminal justice, human rights and related professionals. This roster and the experts are our main tool, and it can be benefitted for further wide-range of activities by partners such as international organizations, national institutions and other partners in order to strengthen accountability. I would like to ensure that we are innovative and proactive in using this amazing resource. Our task is also to make sure the roster is responsive to current needs and that we recruit new areas of expertise that will be in demand in the years to come, for example in new technologies to document human rights violations or store them, or expertise that understand technologies that are increasingly used in conflicts. As to our work right now, JRR experts will continue to be an essential linchpin for documentation and accountability efforts for grave human rights violations in places like DRC, Syria, Iraq, Mali, Myanmar, South Sudan, Ukraine and in a number of other areas. Looking ahead, we also want to share what JRR has learned over the years with partners and community. It is our hope that this wide range of institutional memory will be preserved and shared in order to help encourage the “JRR standard” for investigations everywhere. I see this as an especially opportune time for JRR to do this, as 2019 will mark JRR’s tenth year of operations. On a day like International Justice Day, it’s easy to be discouraged by the headlines. Protracted conflicts like Syria, Myanmar and South Sudan continue to challenge us as our experts carry out investigations. But I draw much hope from JRR’s steadfast commitment to practical solutions and the difference that timely delivery of expertise can make. Our partners and supporters can know that today, the teams that are created to do this difficult work— to design investigative strategies in conflict zones, gather and preserve evidence, or interview victims—are equipped with professionals who are truly fit-for-purpose. That’s JRR’s commitment and one we will continue to deliver on in the coming years.